Life insurance policy change adjustment receipt from the Metropolitan Life Insurance Company in Ottawa for Harry Seidelment in Vancouver. Receipt issued on April 1, 1949. The back side is the French version of a Policy Receipt. Typewritten letter from C.F. 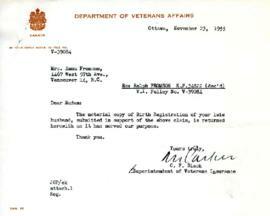 Black of Veterans Insurance to Ann on November 23, 1955 to which has been attached a claim letter from August. A provisional receipt from the Metropolitan Life Insurance Company in Ottawa for Harry Seidelman in Vancouver. Receipt issued on April 1, 1949. Back side has one line filled out that states, "Tender of premium due April 8, 1949." 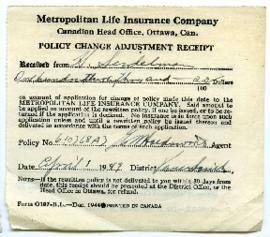 Life insurance policy receipt from the Metropolitan Life Insurance Company in Ottawa for Harry Seidelman in Vancouver. Receipt issued on April 1, 1949. The back side has the French version of a Policy Change Adjustment Receipt.